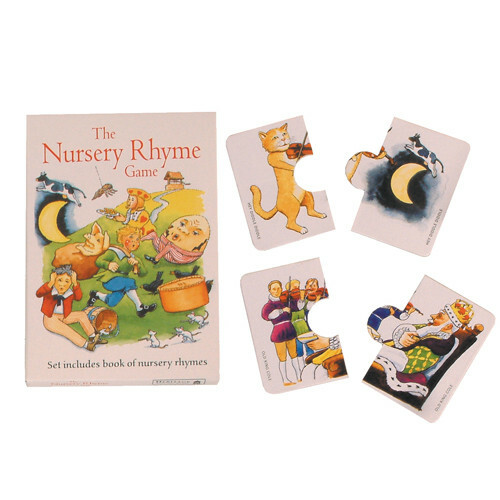 Young children will love this set of beautifully illustrated ‘puzzle cards’ that create a simple matching game for children, with a booklet of well-loved nursery rhymes. Contains 32 playing pieces. Many nursery rhymes had their origin in the 18th and 19th centuries, and it was in Victorian times that collections of these poems for children were published. Some believe that nursery rhymes contained hidden meaning or were based on earlier works, but these ideas cannot be proven. However certainly through Victorian times and into the 20th century the repetition of nursery rhymes delighted young children.